Veteran Icelandic actress Halldóra Geirhardsdóttir plays the eco-warrior Halla in “Woman at War,” from Magnolia Pictures. Icelandic filmmaker Benedikt Erlingsson’s second major film, “Woman at War,” is the quirky tale of an environmental activist who battles Iceland’s government. The absurdist tale, which is Fresno Filmworks’ April 12 showing, successfully combines thrills with laughs. 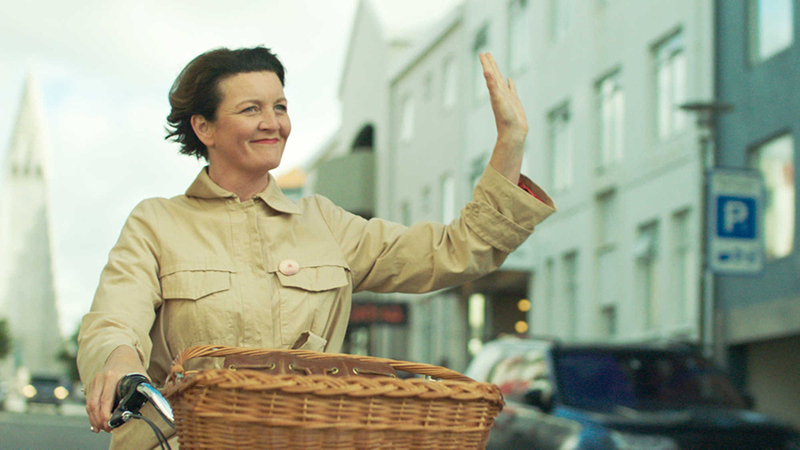 Halla lives a simple, quiet life, riding her bike through a picturesque Reykjavik where she leads the local choir. But Halla is not all she seems; her congenial manner and pleasant smile hide the truth of her secret identity. Like a modern-day Diana the Huntress, she wields a bow and arrow and a circular saw to sabotage the Goliath-like towers of Iceland’s aluminum industry, which mar the beauty of the rugged countryside. Erlingsson, who as a young man chained himself to a whaling boat to protest whale hunting, describes Halla as an “eco-warrior.” He argues she is not a terrorist, because she only harms structures. Halla— as played by veteran Icelandic actress Halldóra Geirhardsdóttir— is magnificent and her quest is dangerous, and while we often fear for her narrow escapes from the authorities, Erlingsson keeps the tone of the film light. Using a live band and Ukranian acapella trio who follow Halla on her missions, he breaks the fourth wall, offering the audience comedic, musical reprieves. At no point does “Woman at War” become a preachy diatribe on the perils of industry and its destructive impact on the environment. We never feel despondent as we mourn the impact of industry on the Earth; instead, we revel in the inspired antics of this Icelandic goddess. The local media refer to the mysterious activist as “The Woman of the Mountain,” but to us she is a lovely woman, leading an innocuous existence. Pictures of Nelson Mandela and Gandhi hang in her home, reminding us of her passion for justice. Unfortunately for Halla, the efforts to hunt her down increase just as she receives news she might be able to adopt a long-awaited child from Ukraine. The symbolism seems clear: Halla, who in many ways represents Mother Earth, is also a woman longing to be a mother. It is impossible not to love her or to empathize with her deep desire to adopt a child. The plot thickens when we are introduced to her twin sister (a New Age hippie, also played by Geirhardsdóttir, preparing to leave for an Indian ashram) and a man who might be her cousin and serves as her accomplice. Things are further complicated by a case of mistaken identity. Erlingsson imbues Halla with a fierce physicality. Watching her trampling the countryside, escaping helicopters and drones, is exuberating. How can we not cheer for her commitment to social justice, regardless of the peril she faces? This feel-good film promises you will leave the theatre with a smile on your face. Cindy Peters Duzi serves on the Filmworks board as venue director and teaches high school English. She blogs about current cinema on her Instagram.